In the June 2014 issue of Columbia Magazine, published by the Knights of Columbus, Alton J. Pelowski offered a profile of Myles Connolly (1897 – 1964), a former editor of that publication. A graduate of Boston College, he would serve in the Navy during the end of World War I, work as a reporter for the Boston Post, and then take over the helm of Columbia, a position he would hold for four years. Joseph P. Kennedy, who was starting a new Hollywood studio, offered Connolly a position as a screenwriter. This was a career in which he would excel, working with well-known directors such as the esteemed Frank Capra. Connolly also wrote four novels and one collection of short stories. The most famous of these is Mr. Blue, published in 1928. Mr. Blue was a modern day St. Francis-type character. The narrator encounters him at various instances in his life and each encounter leaves him changed. 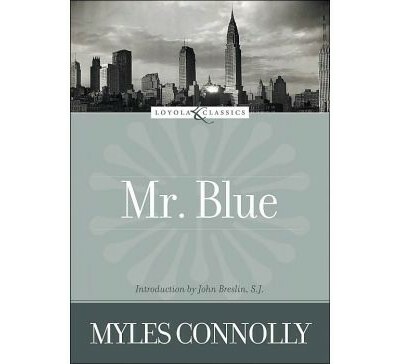 In fact, this novel is less story and more a series of vignettes of moments in Blue’s life. Tell your artists to immerse themselves in the fresh waters of the faith and come up vibrant, clean, alert to the world around them. Then they are ready to design or paint, to carve or write or compose, ready to interpret eternal truth in living terms, eternal beauty in vivid images of the present. Great men dominate their age with their own art. But their art, when great, is almost as much of their age as it is of themselves. They do not try to cast their minds and imaginations into classic molds or Gothic molds or Renaissance molds. No. They take contemporary life avidly into their arms . . . and out of the union is born their art. During another monologue, Blue lays out the entire plot of a movie about the end times and the last Christian on earth. The moving picture was still a relatively new development at the time in which this book was written and Blue has great hopes for its ability to change the world. “Now we have a new art, luminous, vivid, simple, stirring, persuasive, direct, universal, illimitable . . . It can create a new people, gracious and graceful, sensitive, kindly, religious, a people discovering in beauty the happiest revelation of God. No art has the future the motion picture has.” It is interesting that Connolly later had the opportunity to shape that future. Ultimately Blue decides to live and work among the poor, choosing to be homeless and “live in the worst of hovels and the most repulsive of slums” in order to share with them the story of Christ. In the introduction to the Loyola Classics edition of Mr. Blue, John B. Breslin, S.J. compares this work to The Great Gatsby, published three years earlier.“Jay Gatsby stands for everything that Blue, three years later, rejects: the pursuit of great wealth, the willingness to do whatever it takes to win, the craving for status and acceptance. Gatsby is also, as Blue turns out to be, bigger than life, lavish in style, doomed to die young, a striking figure who fascinates and puzzles his own half-admiring chronicler, the reserved future journalist Nick Carraway.” No doubt Mr. Blue was written, at least in part, as a response to the earlier work. The Great Gatsby is part of the canon of high school literature. What if Mr. Blue also joined that canon in an effort to present an entirely different world view? In 1954, Connolly wrote a new foreward to the book’s silver anniversary edition in which he backed off the message of Mr. Blue a bit, claiming that “what is sauce for the bachelor may not be sauce for the married man and father at all.” Life circumstances change and vocations call for different ways of life, but Mr. Blue, a short novel with a powerful message, makes for thought-provoking reading for teens and young adults. Previous ArticleSts. Nazarius and Celsus, martyrs.